When I first started my transition to a plant-based diet, I was still relying heavily on the techniques and standards that I learned in culinary school on how to cook. I eliminated meat, dairy, and eggs, and packed in the fruits, vegetables, legumes, and whole grains. I cooked and processed these staples the same as when I cooked animal products. I replaced my full fat butter, for Earth Balance vegan margarine, and I relied on my pantry of oils. I can still remember my collection; 3-5 different types of olive oil, coconut oil, walnut, chili, peanut, sesame, flax, hemp, and avocado. All of them bringing unique flavors and smoke points so I could utilize all various kinds of cooking methods, because I was taught that you can’t cook, if you didn’t have fat. In culinary school we didn’t have non-stick pans, and almost every time we would add anything to a pan it had to have a layer of oil, butter, or both just to get a dish started. From searing steak, to poaching fish, to sautéing fresh vegetables in school the #1 rule was fat elevates flavor. 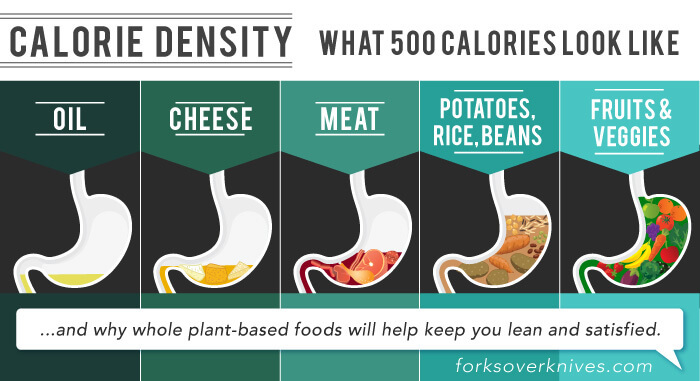 This concept of nutrition density per calorie blew my mind, especially realizing that oils were the most calorie dense foods out there, at 4,000 calories per pound! This got me thinking if I slowly eliminated oils, that would leave me more room for other more filling foods. I gradually tried out new cooking techniques like broth sautéing and dry roasting and I actually started eating more! I love eating, so any method of getting more delicious food in my stomach without expanding my waistline was something I was very excited about. After a while of getting used to the new cooking techniques, I was hooked. I had a new outlook on food, I no longer saw it purely as calories, but as something that was tasty and nourishing. While still acknowledging the golden rule, I learned in school that fats elevate flavor, I just changed the source. Instead of oils, I used higher fat whole foods like avocados, olives, coconut, nuts, and seeds. The way I eat now is very different from when I started my plant-based journey, and I am sure it will change again, but as of now these are my experiences from eliminating oil from my kitchen. I get to eat more food and feel truly satiated. Oil is the byproduct of crushing, grinding, and pressing whole foods and removing fat, leaving the water, fiber, protein, carbohydrates, vitamins, and minerals behind. It is a processed food, you are left with one ingredient which is 100% fat, an isolated concentrated nutrient that has none of the protection that it had when it was in its whole form. To get a lovely visual I highly recommend watching this video on the standard method of extracting one of the most common oils used in America, Canola Oil. Knowing what I learned about calorie density, every time I cook or eat I now ask this simple question. Can I eat the amount of processed food I am ingesting in its whole form? Let’s take your typical salad dressing. A single serving of salad dressing for the normal person has 1.5 Tbsp of olive oil for your basic vinaigrette. 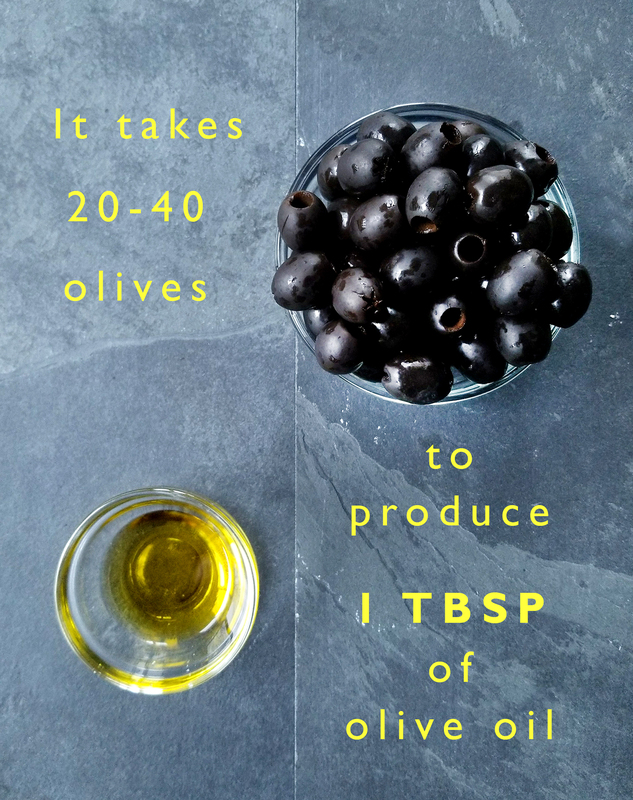 Depending on how ripe the olives are and the variety, it can take 20-40 olives to make 1 Tbsp of oil. Think about that for a second. If I were to eat 20-40 olives at a single serving I would be so full that I probably couldn’t finish my entree. There is a reason for that. If we eat food in its whole form, we naturally get satiated. Now what sounds more filling eating 20-40 delicious olives, or 1 Tbsp of oil? So rather than a drizzle of oil on my salad I reached for some avocado, and maybe an ounce of walnuts. These would still bring fat to my salad but would bring the fiber and vitamins I also wanted, bringing me taste and nourishment. I started to taste food, in its natural splendor. Changing the way you eat takes time, and for the adjustment to really kick in it takes a while for your taste buds to adjust to eating more plant foods. At first it won’t taste as good, because it is not what you are used to, but if you stick with it for let’s say a month, and then you sit down to a double bacon cheeseburger, most people will not feel great because your body has gotten used to a new normal. Your taste buds have had time to adjust to the current food. The same goes for eliminating oils, for as long as I can remember I have been used to the mouth-feel of having everything laced with oil, whether it’s salads, table bread, vegetables, gourmet pizza, pasta, hummus, roasted potatoes, stir fry, takeout food, you name it oil had made it to my plate. First, I started tasting FOOD, as it was. As if I had never truly appreciated the subtle nuances of vegetables. 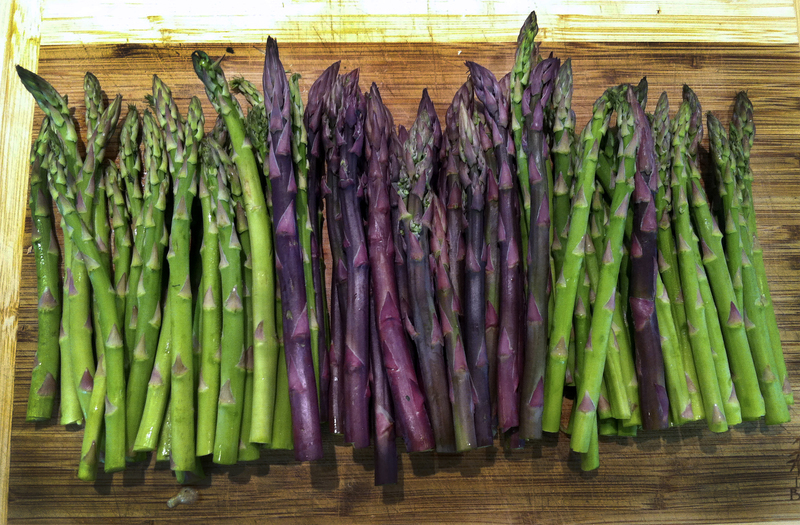 Before, when I had asparagus, laden in oil, salt, and garlic it seemed to have a singular note. 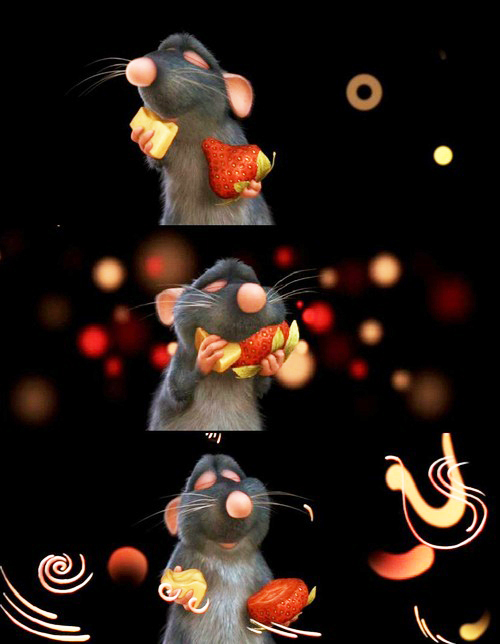 But when my taste buds adjusted to the fat being gone and I had plain asparagus, it was like the scene from Ratatouille when Remy ate cheese and strawberries. Music started playing, and colorful bursts started showing up in my mind. The asparagus flavor was bright and clean, yet earthy and slightly bitter. For once I appreciated the flavors and it gave me a greater insight as a chef to what other flavors would pair well with it. The same went for starches like potatoes, I have always underappreciated potatoes, but when you taste perfectly roasted organic potatoes your life will change forever. They are naturally creamy, satisfying, and have an incredible mineral component that is just so delicious. Have you ever been to an olive oil tasting room? I have, and while I tried to taste the subtle differences in the different varieties of olives, overall it was not an enjoyable experience. I think one reason is because alone, fat is not very appetizing. It coats your entire mouth, leaving you no relief to cleanse your palate. There is a reason why tannic red wines pair well with steak and high fat animal foods, because you need the tannic acid to “remove” the fat from the taste buds, so you can keep tasting the flavors of the steak, essentially cleansing the taste buds in between bites so you can have that first bite reaction every single time. The same goes for Italian restaurants putting out a bowl of olive oil with balsamic vinegar salt and pepper, never the oil on its own. When your food is no longer covered in taste bud coating fat, each bite is just as satisfying as the next. Bottom line, eating less fat increases your sensitivity to it, which brings me to my next point. It decreases the amount of empty fat calories. It decreases sodium intake which in turn decreases fluid retention in our bodies. Last time I checked OILS ARE EXPENSIVE. Especially if you want the organic, cold pressed, single origin kissed by an Italian model kind. And that’s just one bottle. When you start having a collection as I did, it adds up. And the sad part is that most people do not store their oils correctly. Because it is not in its protective whole food form, the oil can easily become rancid if it is not stored in a cool, dry, dark place. I have been in many kitchens in my day and only a handful of them even knew that oils could go bad. Most are stored, on a counter near the range or the oven. So not only are you paying too much money for the oils, most are rancid before they hit your plate! I’m not saying that eliminating oils will make you a frugal shopper, but it will free up some money to buy more fruits and vegetables!!! 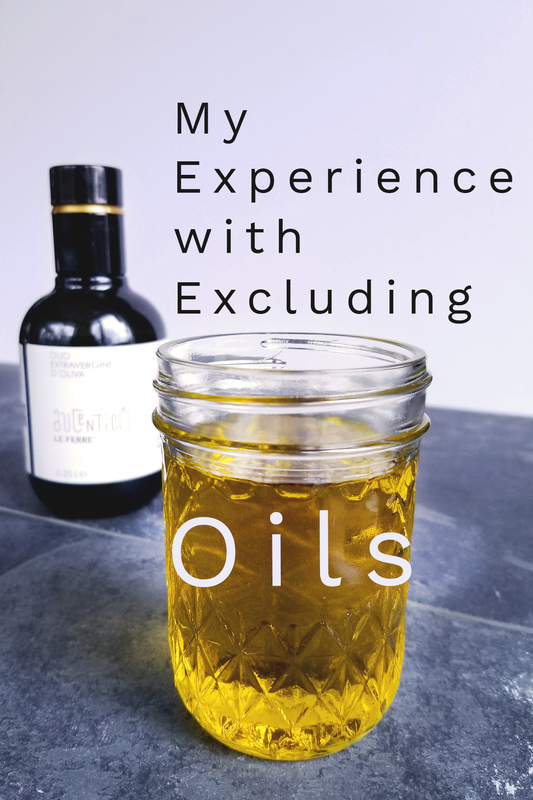 Now I know this is a sensitive topic for a lot of people and there are mixed feelings about oil use and skincare, but I am sharing my personal perspective of my health with and without oils. As I said earlier when I first went plant based I still used a lot of “replacement” vegan items such as fake chicken, vegan butter, vegan Ben and Jerrys, and all my oils. Over the first year I slowly started crowding out the fake products with more whole foods, but I always kept the oil handy. I was always told that coconut oil, olive oil, and hemp oil were wonderful anti-inflammatory oils that benefit skin health. 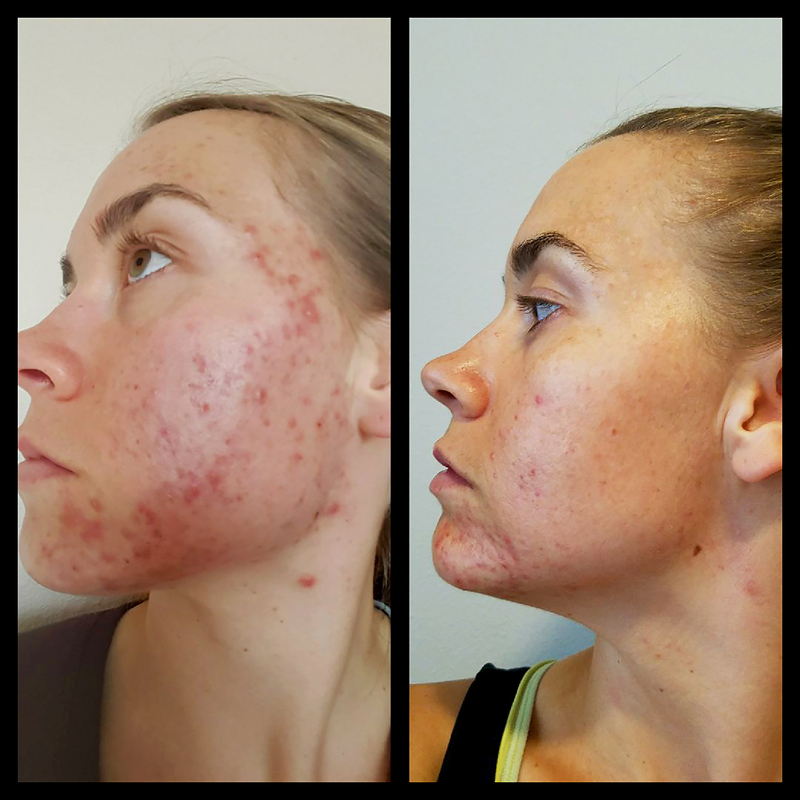 At the time I had still been dealing with severe acne (something I have battled with since college, but that’s a whole other blog post) so I was skeptical to get rid of the oils that had these skin elixir reputations. After a year or so of being frustrated with my skin (still on a mostly whole food plant-based diet) I finally decided to drop the oils. Within the first few weeks I noticed that I didn’t wake up with greasy skin near my nose and chin. A few weeks later I noticed that my large cysts calmed down, and overall my face was less puffy and irritated. Continuing eating without oils and more whole plant foods my face finally started to clear up for good after struggling with cystic acne for almost a decade. I know this is not the case for everyone, I know lots of people who eat very high fat/high oil diets who have beautiful, flawless skin. I also know people who feel that their skin is more supple and healthy since focusing on oils, but I am here for those others who have tried EVERYTHING including increasing “healthy fats” to treat their acne, that eliminating them might be your final solution. Cleanup is faster. I can remember cleaning a simple sauté pan, that had margarine or oil and the first time I would wash it, it would get off the food and the charred bits, but I would always find myself wanting to clean it again because there would be a thin layer of grease covering the entire pan which leads to more soap, and more water. 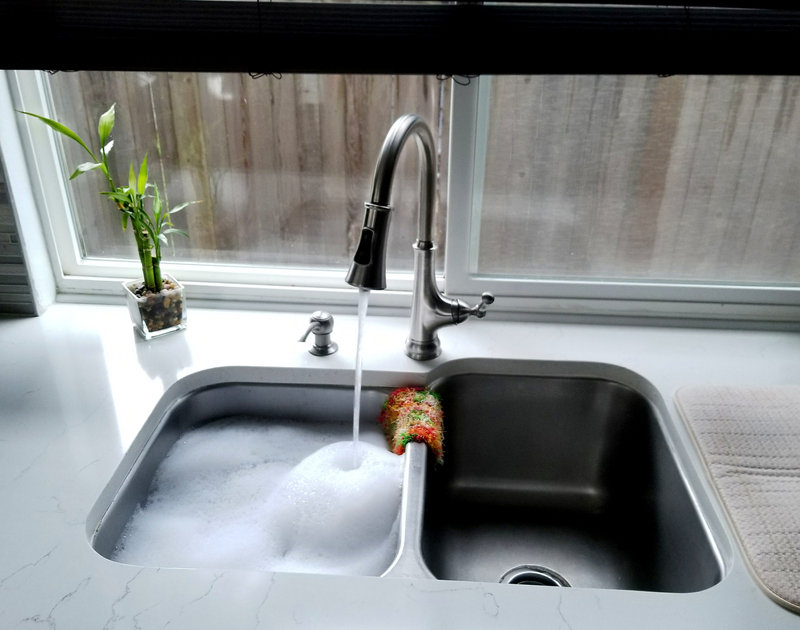 Without the grease washing the dishes once does the trick every time. You don’t have to worry about fat solidifying in your drain. Everybody knows or should know that you should never put grease down the drain. Most people think of bacon grease, but it applies to all fats including plant fats like margarine, coconut oil, and all other oils. When fat gets put down the drain it breaks down into fatty acids and glycerol which mixes with the calcium in the pipes, this mixture turns into a globular mass (think of the way cholesterol clogs your arteries) and ends up causing severe blockages and buildup in the pipes that lead to the wastewater. See full Article here. No one wants to contribute to sewer lines being backed up, the less we contribute, the better. To me, it’s simple. I want to enjoy my food, have it nourish my body, and eat in ABUNDANCE! When I am in control of my food I try to not use added oils, and it makes me feel amazing. Occasionally, I do indulge in more processed, or “gourmet” vegan food at restaurants or bakeries but they are true treats. Having these rich foods only on truly special occasions makes me appreciate the indulgent treats more than if I had super rich food every day. I hope I have inspired you to do your own research on calorie density, and maybe experiment with adding more whole foods to your plate! I know it has been a huge game changer for me!